As one can possibly discern from my sour demeanour, I am here to announce that the conclusion of our collaboration with this wonderful young lady is now upon us. Of course, we wouldn’t just let her leave, at least not without a final, particularly amazing post. And with that in mind, we chose to save the best for the last. This is my sixth post on this blog. Considering how much Yashas has been requesting me to guest author more BoTW posts, it might seem like I have read scores of books. Well, at least not as many as I would have loved to, by this time. And definitely not even close to what bibliomaniacs read by the time they are 23! Led by this dauntless young lady, we continue this month of literary heavyweights with what is probably the very first Pulitzer Prize winner of our list. Let us all strap in, shall we? Winner of the Pulitzer Prize for Fiction, Interpreter of Maladies is one of the most recognised works of its London-born American author of Indian descent, Jhumpa Lahiri. Siddhartha, written by the German writer and painter Hermann Hesse, was written in 1922. Originally written in German, it was first published in English in the United States in 1951. The book remains, till date, one of the most influential novels, based in India, by a Western author. I came to know of the book a few years ago. Having a deep interest in spirituality and philosophy, it was only natural that I was drawn to this book. She is back, Ladies and Gentlemen, and quite frankly, we could not be more glad! And this week, she picks out a book that falls directly into her own backyard. She says she hadn’t written this post with my blog in her mind; she just wanted to share her love for the book with the entire world, and isn’t that the very purpose of our blog? Needless to say, I managed to badger her into sharing her words here. Such avaricious, you know. 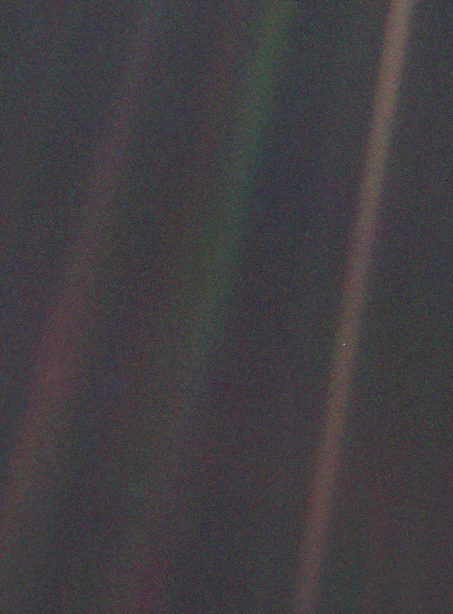 For the uninitiated, might I elaborate just a little on the significance of the phrase “Pale Blue Dot”. It is actually a reference to the photograph of the Earth taken on 14th February, 1990, by Voyager 1 from a distance of roughly 6 billion kilometres. Really puts things in perspective, does it not? Literally the best book I have ever read! You might think I am enlisting the book in that category because I am an Astrophysics student. I won’t deny that I might be ‘biased’ that way, but in all honesty, I feel that this is one book that every person should give a read. Having watched and thoroughly enjoyed the Cosmos series by Carl Sagan, I couldn’t wait to read his books; although, I did wait. I watched that series more than three years ago! Insightful, inspiring and refreshing. Was the Pale Blue Dot just what I had expected? No, it was much more. This is one of the richest books I have read, in terms of content, style and language. Sagan has the ability to capture the imagination of even those people who are least interested in space science. His words are arresting, his style intelligent; what else could you expect from a world-renowned astrophysicist and science communicator? So, after a gap of 30 long weeks, we are back! Thankfully, we have our dear friend Shruti, who is coming back with a much needed series of guest posts. Okay, to be honest, she says she cannot promise anything at the moment. She does not want a long-term commitment, she says. However, we do hope she sticks around for a while. Anyway, Ladies and Gentlemen, put your hands together for Shruti! The discussion about Indian literature is certainly incomplete without talking about one of the most celebrated writers of India, the late R. K. Narayan. If you have grown up in India, you have most probably heard of the name Malgudi Days. Set in the fictional town of Malgudi in the south of India, Malgudi Days chronicles the lives of the simple folks of the town through more than 30 short stories. My first encounter with Malgudi Days was when I was little, when the TV series based on the book was televised on Doordarshan. I still remember the enchanting tune of the theme music, and I won’t be surprised if every single person who ever watched the series or even a few episodes remembers it too. Something about the series struck a chord, and I was drawn to it. Years later, a short story from the book happened to appear in our school English curriculum and having loved it so much, I decided to lay my hands on the book at last! As mentioned earlier, Malgudi Days is a collection of over more than 30 short stories. Check any list of the best works from Indian literature and you are sure to find Malgudi Days in it! There is something very endearing about R K Narayan’s language; it’s simple, yet so powerful. The elements in the stories and the lives of the characters seem fascinatingly relatable. Maybe it’s because I spent the first 11 years of my life in a town and I used to be a very frequent visitor of the village that is my native place. But I doubt if anyone who has always been a city-dweller would not find the stories appealing. Malgudi Days features a plethora of colourful characters. You have an astrologer, a school boy and his friends, who actually go out and play and not stick to their smartphones, a large-hearted postman who knows every single person in the town. You have rich folks, and also poor people trying to make ends meet. The simplicity and the refreshing innocence of the town is one of the main reasons behind the enormous popularity and success of the book. Even though it was written in the first half of the 20th century, Malgudi Days has proven to be a timeless classic. Through the enchanting narrative, R,K, Narayan wove a tale of this simplistic town so well that it has captured the imaginations of people across the country. And I am sure it will continue to do so for many more generations to come. And isn’t that the reason why we have a team? You can start reading Malgudi Days here. We do hope Shruti comes back, next week, and really for a few more weeks hereafter. Anyway, that is all for today. As a kid, I often observed a few friends, and their peculiar attempts to act far beyond their actual age. At a time when I wanted to talk about my favourite Pokemon, they wanted to talk about their favourite stocks… Yeah, this was like ten years back. And now, the same happens in the book clubs I recently joined. People want to discuss Dostovsky and Kafka and Voltaire, but I just cannot move past these genres that I do love. In this day and age, how does one decide which book to read? More than anything else, we depend on our close friends, to set us up with books they think we’d like. Otherwise, we simply make a choice based on popular opinion. That wonderful feeling when you are looking across a crowded room, and you see book just sitting there on the shelf, and you just know you are going to grab it in your hands, take it to your room, and just have a magical night together, that doesn’t really happen as often as we would like, does it?